The sign is not subtle. It says No Trespassing and it’s mounted on a locked gate. There is, however, a gap between the edge of the gate and a nearby post… a gap easily big enough for a small woman carrying a backpack to slip through. And, conveniently enough, we are just that, a pair of small, filthy, exhausted women carrying hiking packs trying to get by. Just past the gate, beyond the power plant that the fence is presumably protecting from trespassers, stand some tall, leafy trees, promising relief from the afternoon sun of the northern Mojave Desert – exactly what we’re after. Sam consults her GPS. She’s got some complicated program marketed to hunters that tells its user the owner of a given parcel of land. We both live in Los Angeles, and recognize the Los Angeles Department of Water and Power (DWP) logo emblazoned on the power plant. To most eyes, this spot, despite the fact that it’s nearly 200 miles away from the DWP headquarters in downtown L.A., looks like city land. But on Sam’s GPS, the patch of ground is marked as property of the federal Bureau of Land Management. Which, we reason, might undermine the DWP’s authority to hassle interlopers. And so we trespass. I slide through the gap first, and Sam follows closely behind. We hiked sixteen miles yesterday and nearly eight this morning, and really, really want to sit down under those trees for a few hours. But once past the gate our first move isn’t into the shade, but towards the edge of an open concrete channel. 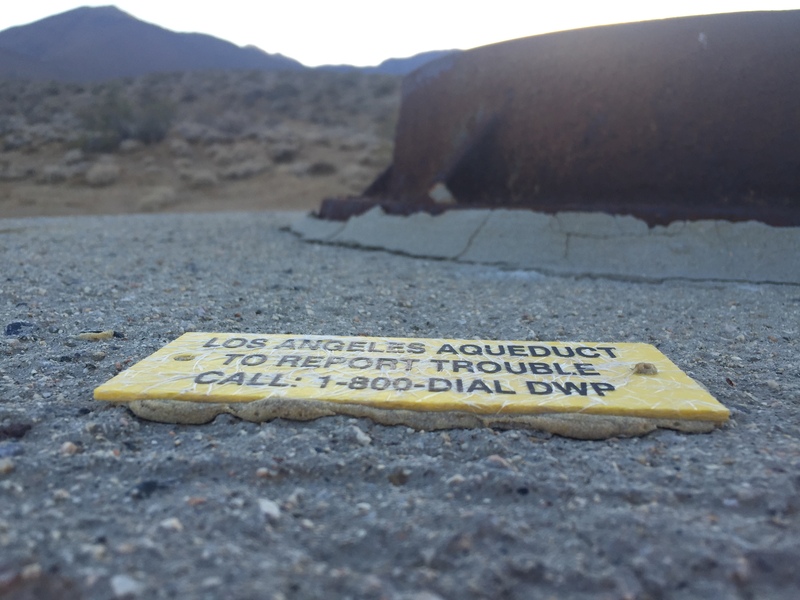 All week, we’ve been walking near (and sometimes on) the Los Angeles Aqueduct. In the stretches we’ve hiked so far, the conduit was fully enclosed, and often looked like nothing so much as a long, thin, concrete road through the desert. There were points when we could hear the flow of water inside the pipe, a taunting sound to a pair of thirsty walkers. Here, we get to witness the open channel right at the point where it disappears into its pipe, which feels like a momentous sight. The rumble of a truck interrupts our reverie. A quick glance confirms what that it’s the worst-case scenario: someone from the DWP is heading our way. Some years ago, Sam – Samantha Bode, a native of northeastern Pennsylvania – decided that she wanted to make a documentary about the L.A. Aqueduct. Not long after she’d moved to L.A. to work as a film editor, she spent a weekend near Mono Lake, one of Northern California’s umpteen beautiful places to hike and camp. There, over 300 miles north of L.A., she encountered something that seemed out of place: trucks bearing the familiar city Department of Water and Power insignia. What the hell was the DWP doing here? Maintaining its water supply, she soon learned. Among other sources, L.A. relies on a pair of city-owned aqueducts to feed residents’ faucets. The first pipeline extends 233 miles northeast of the city. 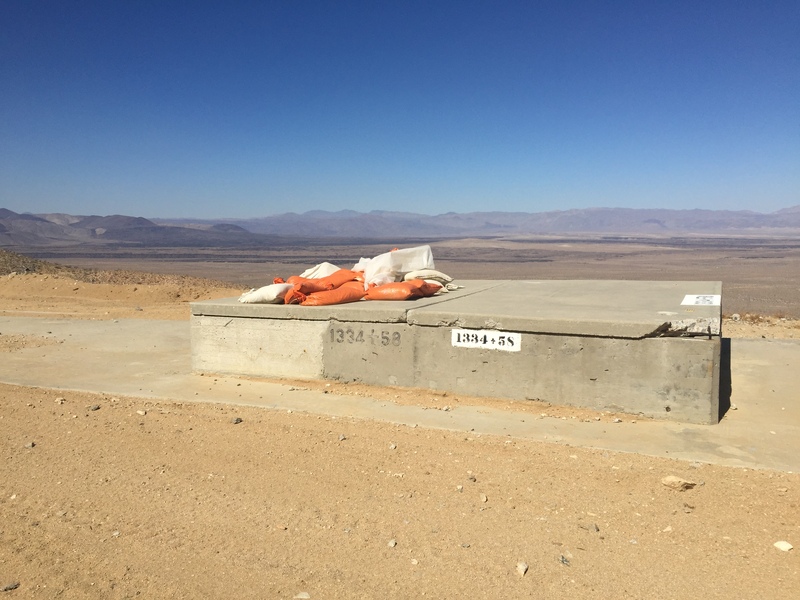 It was completed in 1913 and taps sources in the Owens Valley, a stretch of land east of the Sierra Nevada mountains and west of Death Valley. The aqueduct’s Mono Extension travels an additional 137 miles farther north, all the way up to the Mono Basin – hence the trucks by Sam’s campsite. If you’re looking for them, it’s not hard to find accounts of how the city’s aqueducts came to be. You could fill a sizeable shelf with histories recounting the story and, as their titles suggest – Left in the Dust, Water and Power, Vision or Villainy, The Water Seekers, Rivers of Empire – not everyone involved was thrilled with how things went down. A short version: L.A. city fathers believed that their expanding metropolis needed more water to grow and flourish. So they went looking for water, and found the Owens Valley. The city acquired land rights, which, at least in this part of the world, are tied to water rights. The aqueduct got built. Owens Lake was sucked dry, and the surrounding Valley withered. Meanwhile, L.A. expanded so rapidly that more water sources were deemed necessary. And so the city went about acquiring water rights farther north, eventually building the Mono Extension. There’s more to it, of course. But the relevant thing, for now, is that, for all of that history and all of those books, Sam was floored when those DWP trucks invaded her retreat. And as she read up on their presence, she became aghast at just how little she and her friends in L.A. knew about the pipeline that’s been supplying their city with water for a century. So she decided to walk the pipeline and make a movie about it. For a few days in June of 2015, I walked with her. An anthropology grad student, at the time I was living in L.A., hanging around with water activists and asking what they thought about the city’s water supply, the DWP and the California drought so that I could write about it. When my networks of contacts led me to Sam and she told me about the movie, I wanted to hear everything. We met up again and again to talk aqueduct politics and documentary logistics, and when she asked me if I’d like to walk with along the pipeline for a week with her that summer, I said of course without once considering what I’d do if I got caught sneaking onto restricted land. What now? The my-GPS-says-it’s-federal-land line sounds ridiculous and we both know it. We’re where we shouldn’t be, a fact that the infrastructure and signage have taken pains to indicate. But we have no idea what happens now that we’re caught. The scene in Chinatown where Jack Nicholson’s character gets caught skulking around Department water infrastructure then gets his nose slashed for sticking it in the wrong places plays in my mind. The truck, a standard white DWP pickup, just like the ones we see all over LA, rolls to a stop beside us. The driver rolls down his window, and asks us what we’re doing. He looks skeptical and it’s hard to blame him. But as the conversation progresses, we realize that the man in the truck isn’t all that worried about us sneaking on to protected city property. He sees through the garbage excuses we’re peddling – we know that he knows that we know we’re not really supposed to be here – but he doesn’t mind. Much to my relief, he tells us it’s fine if we wait out the heat of the day under the trees. He offers to drive us around the Haiwee Reservoir, which sits just upstream, impounding the water that produces the hydropower that the plant transmits, when his shift is over. He exchanges phone numbers with Sam so that he can call when the workday is done. He drives away, and we sprawl out in the shade. Not much time passes before Sam’s phone buzzes with a text. The initial idea for an aqueduct documentary was quixotic, in a guerrilla-y sort of way. Just Sam, her camera and her iPhone, walking out of L.A. to see how far she could follow the aqueduct on the strength of Google Maps. Soon, however, the film’s scope expanded. Sam decided that this was going to be a film about the infrastructure that brings water to her city and also about the landscapes and communities that surround L.A.’s far-flung water sources. With the help of her friend and co-producer Angela Jorgensen, she plotted a many weeks-long hike of the full 300+ miles of the aqueduct and took weekend trips up north to film interviews with Owens Valley ranchers and Mono Lake environmentalists. After work at their day jobs, Sam and Angela did the things you have to do make an independent film these days, launching an IndieGoGo campaign and writing grants and seeking sponsorships and cutting a trailer. By late 2014, a spring departure for the trek seemed plausible. They had a title – The Longest Straw –, a social media presence and an evolving relationship with the DWP, whose PR reps were dangling the tantalizing possibility of filming permits and official recognition for the project. But here, Sam and Angela hit a wall. After a lengthy back-and-forth with the PR department, they received a formal offer: you can do your hike, we’ll give you a permit, you just need to cut us a check for $500 and sign over editorial rights to the final product. Sam and Angela were also presented with a printout of text from the Longest Straw website, marked up with the Department’s suggested edits to their text. Flipping through the pages, Sam noticed that her characterization of the ecological destruction the aqueduct had brought to the Owens Valley by draining its water had been marked with a suggestion: why not be more positive and focus on DWP’s recent work on ecological restoration in that area? To put it mildly, the Department’s vision for the movie’s tone was different from Sam and Angela’s. The pair told their contacts at the Department, “Thanks! But Never mind.” Controlling their story felt worth the risk of retribution. Technically, Sam explained to me more than once, the aqueduct travels almost exclusively through public lands open to recreation. So she wasn’t really breaking any laws by walking its course. Even so, she took precautions, hoping to fly under the DWP’s radar. For example, the Longest Straw Twitter account offered a blow-by-blow of the hike, posting photos of creeks and canyons and windmills along the route… all on a 5-week delay. Sam had traveled more than 200 miles north from L.A. when she told social media that she was setting out on the journey. As a result, the whole hike had the faint aura of a cat-and-mouse game with the DWP. While I walked with Sam, we joked at our own paranoia, but never stopped half-wondering if there had been a company-wide email at a certain point: This is Samantha, she is armed with a camera and very dangerous. Make sure she doesn’t tread where we don’t want her. Walking along the aqueduct through the empty desert, this imagined surveillance felt stupid and overwrought and yet at the same time, entirely plausible. Sam, filming the aqueduct with the eastern Sierras in the background. Within the hour the DWP guy is back, presenting us with paper plates piled high with roast chicken, bread, and potato salad, plus a tall can of sweetened iced tea and two bottles of water. We wolf it all down greedily and gratefully, feeling an unfamiliar sense of affection for the Department. The guy sticks around, seemingly glad for the company. He tells us about how little water is flowing into the aqueduct just now – just enough, in fact, to prevent the pressure in the pipe from getting messed up. This low flow, he explains, is because of the drought and because of agreements that require the DWP to leave a certain volume of water in the Owens Valley. For years there were terrible dust storms from the lakebed where Owens Lake used to be, but then the environmentalists sued L.A. and so now more of the water stays up north. Upstream, the Department built a temporary dam to keep water out of the aqueduct. We should check it out if we’re interested in water and whatever, he suggests. It isn’t long before he admits that he thought we were scientists doing some kind of plant survey when he first spotted us. He’s fishing, clearly wants more background on what we’ actually do. But he seems genuinely curious, keen to hear someone else’s weird story about ending up in this remote corner of the state. And so we talk, guardedly but not coldly. An unexpected plate of chicken can go a long way towards building rapport, especially when you’re somewhere that feels so desolate. LADWP detritus in the Mojave. I joined Sam for an especially rugged, dusty stretch of the aqueduct’s path. Over the course of five days we walked about 50 miles through the northern edge of the Mojave Desert, crossing into the southern reaches of the Owens Valley near the week’s end. This is California flyover country, hot as hell and sparsely populated. According to the sign on the freeway, Pearsonville, the town closest to our starting spot that week, has a population of 17. When weekends approach, people from L.A. speed through this area, heading north to Mount Whitney or to Mammoth or even all the way up to Tahoe. Save for the occasional gas station, there’s not much roadside development, and few drivers stop. When you turn off the 395 and onto the side roads that creep westward from the freeway towards the aqueduct (and in some cases past it, farther up, in the direction of the Sierras), the landscape appears much more human-altered than it looks from the interstate. There are networks of gravel roads, passable for most cars and all trucks, as well as smaller, more rugged paths, good for ATVs and dirt bikes. These were mostly deserted in June, but I’m told that they’re well used from the fall through the spring. The day that Angela drove me north to meet Sam, we followed a series of the gravel roads on a route that ended by a tepid swimming hole. When we arrived we found another car parked by a stand of trees, and a young family splashing around in the water. We also found Sam, sitting in the shade and looking thinner and tanner and a bit more morose than I remembered her. She was a few weeks into the hike at this point, and seemed more excited about the In-N-Out fries Angela had brought for her than about seeing either of us. As we drove north to cache big bladders of water along the route Sam and I would walk that week, I felt an unexpected wave of anxiety. My tank top was soaked through with sweat from the few minutes it took to hoist and stow the water bags under bushes along the aqueduct. I already missed iced coffee and had a growing suspicion that I should’ve brought stronger sunscreen. The next morning, it became apparent that I wasn’t at all prepared for what I’d gotten myself into. I could manage the walking, though my shoulders ached from the weight of my pack. But I couldn’t really handle the heat or the dehydration. On one memorable day, I drank four liters of water and peed exactly twice. I sweated out the rest, my clothes sopping throughout the day. I was constantly thirsty and my head throbbed, but we had to conserve water between caches. I began to hate the desert landscape, not even remotely charmed by the jaunty-angled Joshua Trees or the tall-eared jackrabbits that frequently bounded past us. This place was terrible, a hostile environment not meant for the likes of me, or anyone sane. Before he leaves us to finish up his shift, our guy asks if he can take a picture of Sam and me. We stutter and blush awkwardly in response, but can’t dredge up a good reason to say no. So he pulls out his phone and we sort-of smile, suddenly conscious of how very dirty we must look. Then he leaves and we sit down and talk about how weird that was and speculate about the photo’s fate. Will he send it to someone? If so, whom? Will the image be floating around the DWP’s email system for months to come? Will someone Sam met while seeking a permit or I interviewed for my research recognize us? Or will the picture just live in the guy’s phone for some weeks or months, until he gets one of those popup messages that say you’re running of out of memory and then he’ll delete it? Seeking distraction, I welcome Sam’s offer to play Go Fish as we wait out the heat of the day. This is an improvement from the previous couple of days. Surly from dehydration, I’ve been rebuffing Sam’s attempts to talk and play games during our rest periods, shoving my nose into The Brothers Karamazov and making her jealous because she didn’t bring a book. Today we play slowly and amiably and sometimes she wins and sometimes I do and it’s mindlessly pleasant. After awhile I conclude to myself that the photo probably isn’t leaving that guy’s cell phone, so whatever. How, exactly, did I get the impression that the DWP could be so powerful and potentially omniscient in this part of the world? My grasp on the sheer scale of the DWP’s operations and the extent of its footprint in the Owens Valley certainly helped. The Department is the nation’s largest publicly owned utility, with an annual budget of over $800 million and over 7000 miles of water pipes under its management. In Inyo County, which includes the Owens Valley and the stretch of desert Sam and I walked that week, the Department owns far more land (174,500 acres) than do all other private individuals and businesses (121,400 acres). The Department’s land use policies severely restrict development in the region, which keeps rents surprisingly high for such a thinly populated area. Controlling so much of the Valley’s land and a huge portion of its water, the DWP is often described as a powerful colonial presence here. But meandering through the Mojave taught me to see the Department’s grip on its hinterland holdings as somewhat looser than I’d imagined from the outside. Walking along the aqueduct, the Department looked a lot less monolithic than it did on Inyo County’s land use maps. While the DWP unquestionably controls a big chunk of the region’s land development, day-to-day land use is another story. Put another way: there are restricted lands, and then there are the individual people responsible for enforcing those restrictions. At times, even the remote stretches of the aqueduct itself seemed beyond the Department’s scope of vision. One day, for instance, Sam noticed a leak in the pipeline, and she actually called the DWP. However, it turned out that the phone number for reporting aqueduct issues to the Department, which is stamped on the concrete conduit at regular intervals, connects callers to a central switchboard. When Sam explained the problem she was observing and her location, the operator fielding the call was perplexed. She had never heard of that place – was Sam sure that this was really DWP infrastructure? When Sam confirmed that, yes, this was part of the Department’s aqueduct, the operator said that she would pass along Sam’s phone number to the appropriate party and that someone would get in touch to follow up about the situation. No one ever called. The DWP guy doesn’t want his face on camera, he tells us – doesn’t want to get in trouble with management (which, for the record, is why I’m not using his name here). But he’s happy for us to record his voice as he tells us stories about living up in the desert, the lonely work of managing the reservoir and the dam and the power plant in this sparsely populated stretch of eastern California. And so when his shift ends, we throw our packs into the bed of his pickup, and shout-talk about how neighbors like to sneak through one particular hole in the fence to fish in the reservoir’s waters as he careens along the dusty roads. We cover a morning’s worth of hiking in a matter of minutes, leaning on the sides of the truck bed. 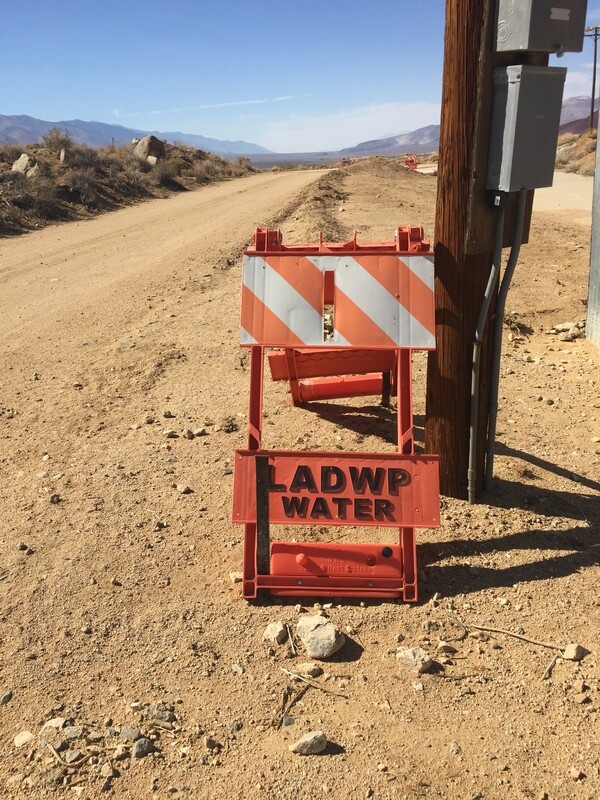 I marvel at the idea of a couple DWP employees somehow monitoring so many miles of reservoir – which, as the No Trespassing sign and the fences suggest, is officially closed to the public – for intruders. I ask him about how this works, and he laughs. Basically, it doesn’t. The hole in the fence is just one of many access points. While there’s a formal prohibition on locals using the space for recreation, in practice, the oversight is too fragmentary to enforce the ban. So the reservoir is fished, and the ATVs rumble along the rutted dirt roads that surround it. When he sees an interloper, our guy approaches him or her, explains the rules, and requests a speedy exit. But, he shrugs, he’s not going to come back and check on them when his shift ends (he’s certainly not getting paid overtime) and they know it. He doesn’t mind their presence – he just wishes they’d stop leaving so much damn garbage. He parks the truck by a gate at the edge of the reservoir, and the three of us talk for another hour, riffing on environmental injustice in L.A. and the meth moving up and down the 395 and the military training exercises that occasionally interrupt the stillness of the desert here. When he finally drives off, Sam and I set up camp near the spot he suggested and then walk to the edge of the reservoir. We wade in and watch an otter splash around in the twilight. I left Sam on the trail two days later. After a thirsty night camped by a dry streambed, we walked to a rare roadside café in Olancha (population as of the 2010 Census: 192), pounded water and coffee and heaping plates of breakfast, and chatted gamely with fellow customers who wanted some explanation for our grimy, gear-laden presence. Angela arrived from L.A. in the late morning, and after hugs and a brief stop for supplies, she deposited Sam in a motel for a rest day and drove me back to the city. Drought-plagued L.A. looked shockingly verdant in comparison to the desert, all fat-leaved trees and burst-open flowers creeping across fences. Back in my apartment, I indulged my dearest fantasies from that week in the desert: a long shower, a vat of lemonade, a full bottle of icy water on my bedside table as I binge-watched Orange is the New Black. I felt lucky and spoiled and grateful with the abundance, and acutely conscious of how far the bounty had traveled to reach my glass. Sam made it to the aqueduct’s end at the Mono Lake intake in late July. No one from the DWP harassed her along the way, or afterwards, when she revealed over Twitter that they’d been lying about her location all along. She also told me that when she encountered another aqueduct leak farther north, she didn’t bother to call the Department again. Instead, she filmed the water streaming out of the pipeline for a few minutes, then filled up her water bottles and walked on. Sayd Randle writes on the cultural politics of water, landscape, and infrastructure in the American West. She is a doctoral candidate in environmental anthropology at Yale University and a huge Octavia Butler fan.